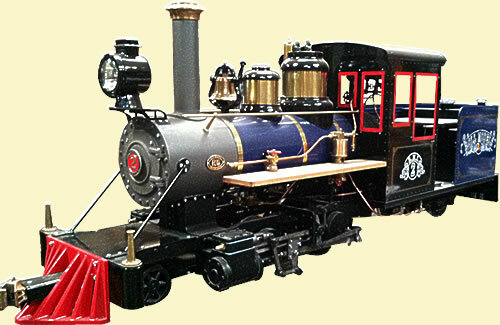 Sandy River Forney Narrow Gauge Steam Locomotive By RMI Railworks- Miniature train and railroad equipment for your club, backyard, or park. Because Sandy River is based on 2-foot gauge prototypes, it is a large, robust locomotive. Its proportions make it an ideal prototype for the miniature railroader who wants to ride his loco. With a 4-wheel trailing truck and a generously sized bunker, there is ample room for a full scale engineer. Sandy River models are offered as raw or machined castings, raw or machined burn-outs, or complete, ready to run engines. Water legs style boilers and Walschaerts valve gear are standard.